Don't worry; it will still be many, many years before your toddler will be ready to speed through the skies of Metropolis. Phew! That is such a relief, no? We mean, parents have enough to worry about these days: safe Halloween candy and safe drinking water and safe carseats...you shouldn’t have to sweat it out over the nuanced safety of regulation superhero flying. We know your kid is super special, but according to the international superhero code, he needs to wait until he’s 18 years old to join the force of vigilantes protecting your city! (He can get a permit at 16). While, yes, the day will eventually come for your little Clark Kent to take off from the ground, until then you may want to suit him up in this adorable Superman Fleece Romper and get used to having a tiny man of steel around. Raising a superhero is serious business. 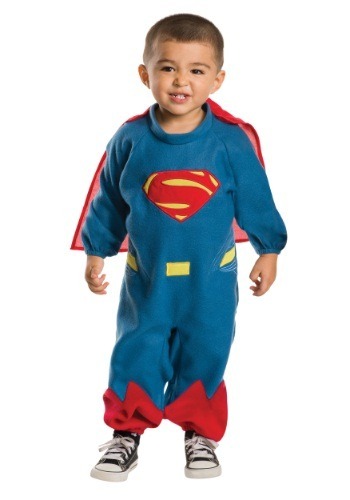 He will love the cozy feel of this costume, while you will love cuddling a pint-sized international icon. Not to mention, this fleece romper opens at the inseams for easy diaper access (hey, even Superman has to be potty trained). Plus, your little guy gets to rock the "S" Superman shield and classic red cape. So who knows, maybe he will be so tickled by this costume that he will get his fill of superhero-hood before the whole “fly through the air and fight crime” thing kicks in! Either way, he’ll be happy as can be to take this look out to trick-or-treat this Halloween!